NEW YORK (CNNMoney.com) -- Store theft added $423 to the average American family's shopping bill this year according to a new report on retail theft released Tuesday. "That's a phenomenal figure," said Joshua Bamfield, author of the 2010 Global Retail Theft Barometer report from the U.K.-based Center for Retail Research. Compared to the $186 global average cost of theft to consumers' budgets, retail crime hit American consumers much harder, he said. In 2010, U.S. retailers lost about $40 billion in stolen goods, or 1.5% of the nation's total retail sales. Despite the eye-popping figure, losses were 6.8% lower from the prior year. Still, those losses are passed on to consumers. Consumers lost $422.68 from their shopping budgets this year, down slightly from $435.17 last year. Bamfield said the decrease in retail crime in the U.S. correlated with retailers boosting security spending by 12.5% this year. The same trend was seen globally. 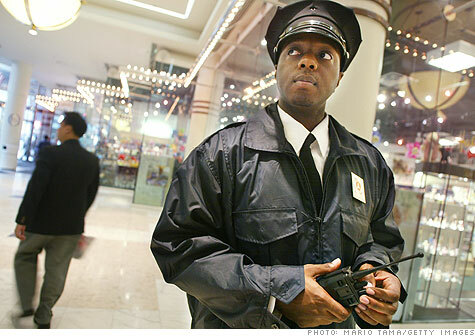 Retail theft worldwide fell 5.6% in 2010 versus last year. The annual report identifies top trends in retail crimes in 42 countries, including the United States, China, India, Europe, Japan and Australia. The report was based on a confidential survey of 1,103 large global retail companies. Organized crime biggest problem. For American merchants, Bamfied said "organized retail crime," more than employee theft or shoplifting, has their biggest concern. Organized retail crime involves a "gang" of people who steal entire shelves of products such as beauty care items, baby food and trendy jeans -- not for their own personal consumption -- but to resell them for a nice profit. 0:00 /1:31How would you spend $1,000? The report showed 47.8% of sellers reported a rise in losses from this kind of crime in 2010, compared to 35% last year. In total, Bamfield said employee theft cost merchants about $17.1 billion, shoplifting cost sellers $13.7 billion, while supply chain errors or fraud cost retailers cost about $1.7 billion. Thieves bagged a wide range of items, but tended to focus on expensive, popular branded items, including perfume, cosmetics, even deodorants. In groceries, thieves targeted fresh meats, coffee and infant formula. Clothing and auto parts also were popular items for theft this year. "Criminals also loved anything with the 'Apple' logo," said Bamfield. He also noted an increase in theft of pharmaceutical products, either for resale or for illegal use.